Sweet! Glad you guys got time for yourselves. Am I a bad mother because we regularly have some of those in our house??!! 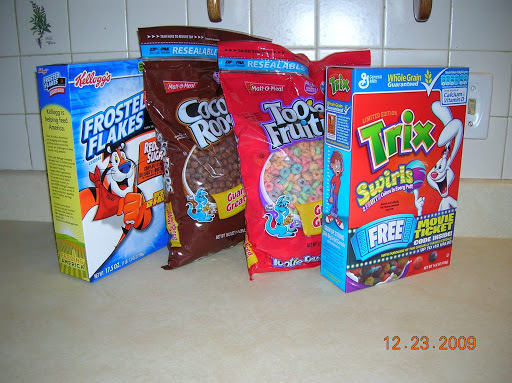 My Mom NEVER bought “fun” cereal when we were growing up, so I do indulge the kids with that sometimes! We had a date night too, the first night my hubby got home from his training. Glad you got some grown-up time together. I save this stuff for birthdays and other “celebrations”, but those seem to come fairly often (the kids all have different birthday months). They ALL heartily approved this reward for going to bed with no trouble to the young babysitter, so I think I'll keep them in this “deprived” state and utilize the reward when necessary.